Life today is all about speed, speed, speed; about how fast we can shop, how soon we can have something sitting in front of us and what the return time on a piece of clothing is. And, while in some cases this can be a blessing for a last minute event you’ve forgotten to get an outfit for, it also can take a lot of personality out of the clothes we wear. ve its own cutting room on site. Between the three highly skilled and trained cutters who work there, there is 80 years experience – not really the same as ordering the first shirt you see from the first online shop you come across, is it gentlemen? The process couldn’t be easier: one of the three cutters will guide you through the process and advise you at each step. A proper taking down of measurements is required with over 20 measurements being made as well as looking at the way you stand, your build and the whole configuration of the shirt. And, with in excess of 3,500 luxurious fabrics to choose from, you’ll be stuck for choice – but in the best way possible. Once you’ve made your selection – also choosing the collar and cuff style that you want – you bid farewell to your cutter and upstairs he goes busying himself with his notes. A paper pattern is made and a sample shirt is cut. This sample shirt is sent to the workshop in Andover where it is sewn together by one of their expert seamstresses where it is then washed and then sent back to the store in Piccadilly. Oh, and one last thing, if you like having things personalised (which gentleman doesn’t? ), then hand-stitched monograming is available, too. So there you have it, gentlemen. 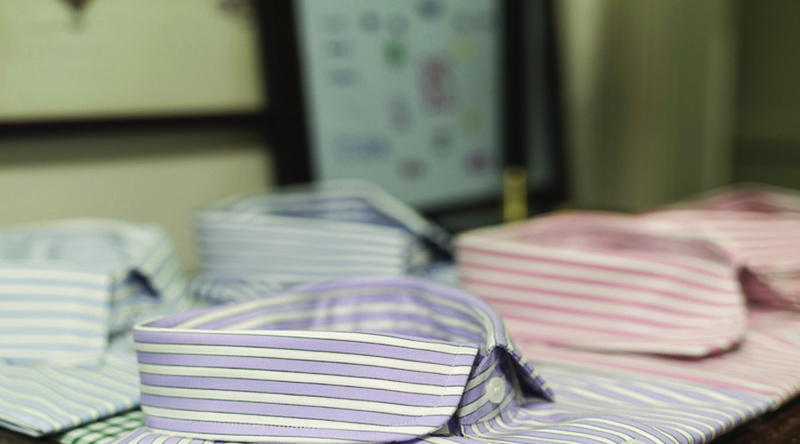 You can’t beat personal, and Budd Shirtmakers do personal very well.